The area of Glendora in which I live, the tree grows and the treedeck is built is on the alluvial fan of Big Dalton Canyon. Big Dalton Canyon frames Mount Baldy, the highest peak in the San Gabriel Mountains, from many locations in Glendora. Unfortunately you cannot see Mount Baldy from my treedeck as Blue Bird Hill blocks the view. 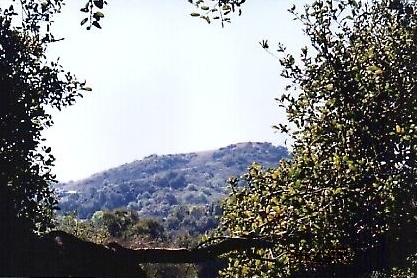 The South Hills separate upper Glendora, which is in a valley created by the streams of the Little and Big Dalton Canyons, from the rest of the San Gabriel Valley. This area is sometimes referred to as the Glendora Ampitheatre. The South Hills of the Glendora were called the San Jose Hills in the mid-1800's. The street I live on is named San Jose as it was one of the first residential subdivisions of land out of the San Jose Addition. The San Jose Addition was an addition to the Rancho San Jose. The Rancho San Jose was started in 1837 when Ygnacio Palomares and Ricardo Vejar entered a request for a grant of land on the unoccupied plains east of the Puente Hills. Juan Bautista Alvarado, their friend and the governor of California approved the grant April 15 and they were given possession August 3. Luis Arenas, Ygancio Palomares brother-in-law, joined up with his brother-in-law and Ricardo Vejar and they petitioned the governor, Juan Bautista Alvarado for additional grazing lands. These additional lands were granted on March 14,1840 and became known as the San Jose Addition. Henry Dalton was born in England in 1803. He left at England at 17, sailed to Callao, a small seaport of Lima Peru and became a merchant eventually commanding a small fleet of merchant vessels. In 1841, after business troubles and prolonged illness, he took his best ship, the Rose, and decided to smuggle goods into Mexico, as Santa Ana, now in power, had decreed that all prohibited goods be burnt, thus catapulting their value. Finding smuggling less lucrative than expected he decided to settle in California. By 1846 he had become a prominent figure in California coastal trade and occupied a store on Calle Principal, what is now the corner of Main and Spring, in the Los Angeles pueblo. In 1844 Henry Dalton purchased Luis Arenas 1/3 portion of the San Jose Rancho, the San Jose Addition and the Rancho Azusa. (approximately the area of the present day cities of Claremont, Pomona, Laverne, San Dimas, Glendora, Azusa and Irwindale) On April 12, 1845 after petitioning for a grant of the Canyons on the Azusa and Boca Megra (now San Gabriel and Dalton Canyons) Henry Dalton was awarded the grant. Dalton increased his holdings to include the Rancho San Franscisquito and Santa Anita. In the end Dalton owned an unbroken expanse of land from the present day San Dimas to the eastern edge of Pasadena.